While there may be times decisions must be put on the fast track, like in emergencies or times of crisis, often rushed decisions are a result of impatience. If applied to decision-making, we could say that we must put great care into the decisions we make to be sure they are glorifying to God and made in a Christ-like manner. 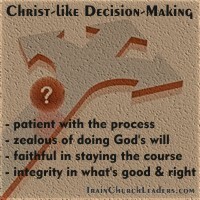 God is just as concerned with the process in decision-making as He is the end results. We must take the time to pray about the issue because God wants us to trust Him through the process since He sees the beginning from the end and knows what it best. We must give people sufficient time to think it through and pray over it so they can be involved in the process since God designed the Body to function interdependently. If we don’t first ask the right questions, we may not line up with God’s purposes. If we don’t invest sufficient prayer, we may not be pulling on God’s wisdom and power. If we don’t get input from others, we may not be following God’s design for the Body. Read through the Gospels and you will find that Jesus took the time to pray before, during, and after ministry decisions and activity. Jesus took the time in discipling others to involve them in the process, asking them questions and listening to them. If we want to be Christ-like leaders, then we must be patient with the process. If you struggle with impatience, having a tendency to make rushed decisions, make a conscientious choice to yield to the work of the Spirit in this area of your life. According to Galatians 5:22, patience is a fruit of the Spirit.